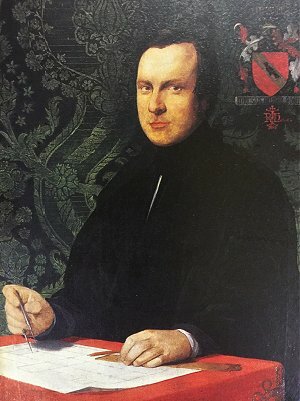 Augustus Welby Northmore Pugin was the son of a French draughtsman Augustus Charles Pugin who fled to England to avoid the French Revolution. He trained his young son to draw Gothic architecture to use as illustrations in the books he wrote and almost certainly the main reason why his son became the number 1 leading designer in The Gothic Revival Movement in furniture and architecture. A.W.N. was a fanatical tireless designer and a monumental workaholic. He was the most important man who changed Architecture and furniture design and influenced style throughout the whole of the Victorian period. His principles of honest design were used and re-interpretated in the hands of many of the most important architects and designers of the 19th and 20th Century and they carried those principles of honest craftsmanship in design for almost another 100 years. He was invited by the architect Charles Barry to work with him on the designs of the interiors for the Houses of Parliament or The New Palace of Westminster it's given name when it was built after the great fire raised to the ground the original buildings in 1834. This was to be Pugin's most important commission ever, he was responsible for the interiors, the external detailing and even the decoration of Big Ben the latter modelled on the clock tower at Scarisbrick Hall which Pugin had designed for Lord Scarisbrick in 1836. Pugin nearly always worked alone, he never had assistants and he once was reported to have said 'Clerk, my dear sir, clerk? 'I never would employ one. I should kill him in a week. His only escape was boating and Michael Trappes Lomax quotes him as saying : there is nothing worth living for except Christian Architecture and a boat. He had a smack and actually traded woodcarvings from Flanders and he was shipwrecked near Leith in 1830. This love of the sea was strong in him to the end of his life. He was a deeply religious man who converted to Catholicism at 23 years old. The study of ancient ecclesiastical architecture was the main reason he changed his religion a very important decision which would help his future career flourish. Pugin educated at Christ's Hospital also known as the Blue Coat School. Pugin shone with talent for design and at the age of 15 was employed by the London furniture makers Morel and Seddon, designing furniture in “gothick” style for Windsor Castle and at the same time he was also designing freelance. At 17 Pugin was designing stage scenes for “Kenilworth” the ballet in The Covent Garden Theatre, for Sir Walter Scott and he started working with Sir Charles Barry on designs for King Edward’s School, Birmingham In 1833 and this was followed in 1835-6 by the designs submitted for Barry’s entries into the competition to build The new Houses of Parliament. In 1835 Pugin’s book “Gothic Furniture in the Style of the 15th Century” was published showing a new study of medieval techniques in furniture construction. He built his 1st house in 1835 'St. Marie’s Grange', at Laverstock, near Salisbury in the old Gothick style, a 15th century looking house with a tower and from the tower Pugin would watch out for ships that would be forced upon and wrecked on the Goodwind Sands. He would sail out his boat The Caroline, to rescue these ships and their cargo where he was very well rewarded from the salvage of those vessels. He married Ann Garnett In 1831 and in the same year was actually sent to jail for non-payment of rent. When released he opened a shop in Hart Street, Covent Gardens, supplying furniture and ornamental carved work for houses all over the British Isles. In the very beginning the business was quite a success but sadly failed not too long after. His wife Anne died in childbirth in May 1832 and in 1833 he married Louisa Burton and moved to Salisbury, Louisa bore him 6 children, among whom were Edward William (1834-1875) and Peter Paul (1851-1904) who both joined the business. Both received the decoration of the Order of St. Sylvester from his eminence the Pope. Pugin was a short stumpy plumpish man who usually wore a sailor's jacket and loose trousers, he looked more like a sailor in his shabby attire than the most important Gothick designer of his period. Like Morris and Ruskin he was a great speaker and could hold an audience completely in his conversation with little humorous touches. He was very honest and to the point and never verbally vicious as so many were in that period. He taught and trained his own workman who respected him with great pride and whom were always loyal. He was a complete work-aholic often working all the hours of the day and night and into another day, he devoured his work load with gusto and was ever eager to add more to his enormous appetite, he drew with the most delicate precision and his artistry of architecture drawing was masterly, a true intellect of the highest degree but this proved his demise because Pugin died insane from a mental collapse from overwork in 1852 at the age of just 40 years old. Scarisbrick Hall was 1st built in 1595 by Edward Scarisbrick and over the years additions were built until up to 1873 when at this time there were 46 rooms. There was much restoration of the Hall by Thomas Scarisbrick between 1813 and 1816 the works were carried out by John Slater and Thomas Rickman. Rickman was a Professor at The Royal Liverpool Academy of Arts and this is when the Hall was given it's face lift in the true Gothic style. In 1833 Thomas Scarisbrick died and Charles claimed Scarisbrick Estate and Eccleston Estate. He was opposed by his 2 sisters in a lengthy court battle which he won in 1838 bringing him an annual income of £40,000, he owned coal mines at Wrightington and Shevington and was the biggest property developer in Southport, a seaside town next to Scarisbrick where he had acquired a large amount of land and built much property. By the 1850's his annual income was £60,000. He had become quite reclusive in has later years and died in 1860 and what's quite interesting is that Charles Scarisbrick wanted no relatives at his funeral and with all the wealth he had accumulated he wrote that he wanted only servants to morn and to carry his coffin and the coffin to be homemade in simple oak and to be buried in the estate cemetery in a simple grave. His plain coffin was carried to the chapel through a meadow, a wheatfield, a potato field and a garden. Pugin's exterior is a real eyeful and his son Edward William Pugin did later additions of the tower which replaced his fathers and the East wing which was mated to the original building by the octagonal tower with 8 enormous heraldic doves the emblem of Scarisbrick on top and he also added the stables with it's castellated entrance and a wonderful little internal chapel which he did for Lady Anne Scarisbrick. It all blends in almost unnoticeably certainly to the untrained eye but it was Augustus who had the edge on the exterior and E.W. who without doubt was much more lavish on the interiors and therefore much more sumptuous especially in the Blue drawing room, Lady Anne's bedroom (which is directly above) and Lady Anne's chapel. Inside the chapel it has wonderful marble angels at the base of the marble columns that form the base of the arches to the vaulted ceiling within the chapel. Augustus originally started at Scarisbrick Hall in 1836 designing the fire place in the Great Hall and in the garden the stone circular garden seat which is segmented into 4 seats with only enough room for two to sit at each quarter, designed this way to give I presume a little privacy between couples. Pugin started the main works in 1837. Looking from the front left and the left handside of the hall just below the parapets he has put comical gargoyles and imaginary creatures which smile and welcome you, his playful and humorous design stands you to the spot with your head cocked up in awe it excites one and leaves you quite enchanted. He added the bay window in the library, the garden porch and the north west turret as well as external and internal decoration and he also started the design for the south front wing. AWN Pugin's work must have been quite difficult as Charles Scarisbrick wanted to preserve the old hall so Pugin had to successfully join the two and within this he shone, he devised skilful plans to join the old part of the hall to the new part with corridors on the ground and 1st floors, he ingeniously overcame the problem of light by putting skylights over the east-west corridor and a glazed turret above the point where the corridors crossed and he made the upper corridor half the size to the ground floor thus allowing light to pass through to the ground floor. In 1838 Pugin designed the north elevation and the clock tower in 1839. The clock tower was replaced by EW Pugin with the main tower which one can see today but AWN Pugin's clock tower inspired the clock tower used at The Houses of Parliament, 'Big Ben' which is why this is the most important works he had accomplished beforehand and played a big part in winning him the commission to design the interiors for the Houses of Parliament. At Scarisbrick Hall in 1840 he designed the humorous creatures that smile down at you from the parapet, the main staircase and the staircase to the roof. Works were being carried out on the windows of the Great Banqueting Hall where internally there are scenes showing eating and drinking. In 1841 Pugin designed the geometric windows which are in the library and the lead work was originally finished with gilding. He carried on from time to time working on Scarisbrick Hall only until 1845 because in 1844 he had started the largest ever commission of his whole career, designing the interiors and furniture for the New Houses of Parliament. EW Pugin had already been designing for Charles Scarisbrick before Charles death in 1860 as some furniture clearly designed by him which has turned up over the years with the CS monogram proves this. All the furniture and furnishings were removed and sold in 1945 and again 1963, luckily just in the nick of time Scarisbrick council came in and purchased all the fixtures and fireplaces basically everything that was fitted and fixed to the Hall which were also going to be sold at the same time sadly they didn't purchase all the original Hardmans brass chandeliers or all of the original furniture. When Lady Anne Scarisbrick returned from Paris where she had lived with her daughter Eliza to claim the hall in 1861, she became a great patron to E.W.Pugin and let him have an almost completely free hand. All the interiors are phenomenal and amazingly all still in tact bar a small ceiling area within the bay window to the left of the main door and few damaged tiles in one of the fireplaces which happened when it was used as a college many moons ago, the hall's custodian 'Ian' told me the college girls did the tile damage when it was used as a dorm although he wouldn't reveal what had actually happened just smiling wryly as he told of an old lady whom remembered some of the antics the girls got up to, the mind boggles! Even the original Pugin curtains still hang in some of the rooms. The main Hall is exquisite with a fantastic vaulted ceiling all polychrome painted with wonderful gold's and reds and here is the only piece of Augustus furniture left in place, a large carved settle. The Mosaic floor is a feast for Gothic eyes and in perfect condition with all the AWN brass vents around the sides for the underfloor heating which Ian informed me still works very efficiently. What was quite intriguing was that Lord Scarisbrick was a great collector of early 15th, 16th and 17th Century carved panelling and statues from all over the world and Augustus shared his interest as he was also a great collector of the like and what's very interesting is that Pugin had to incorporate most of the Lords collection within the panelling, staircases, railings and ceilings which one can detect immediately on viewing and easily distinguish between what is and isn't by A.W.N.Pugin. From 1844 Pugin was designing the interior decoration and furniture for the new Houses of Parliament and he also worked for his own busy architectural practice and wrote even more books. For a man who only lived for 40 years it is extraordinary his output in that time, that he revolutionised Architecture in the mid Victorian Period that the genius of Pugin had managed to so the seed and influence the course of architecture and design to encompass the ethos of The Arts and Crafts Movement 40 years before it began.